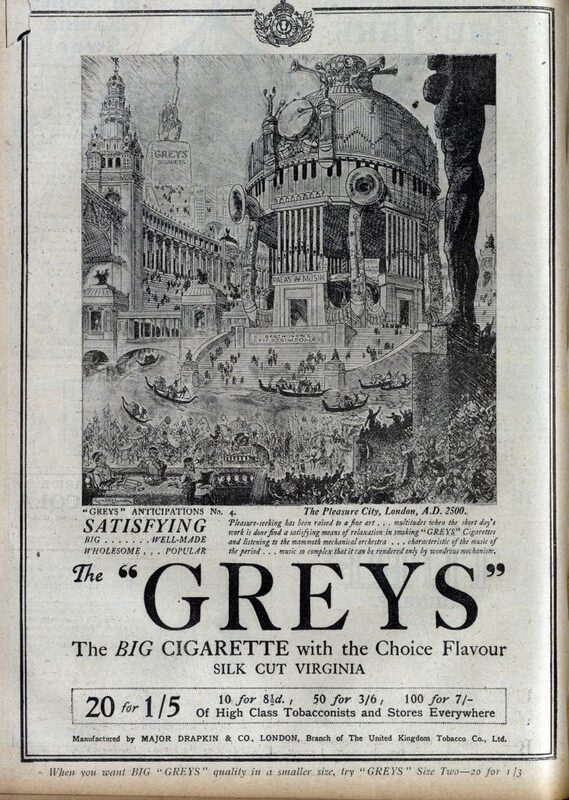 Back before the public came to terms with the grim causal relationship between cigarettes and cancer, smoking was a jolly affair, whose pleasures extended well beyond the physical act. Smoking was sociable. Yes, there were certain situations in which three on a match could spell doom, but a far greater likelihood that lighting an attractive stranger's coffin nail might kindle conversation, and more. 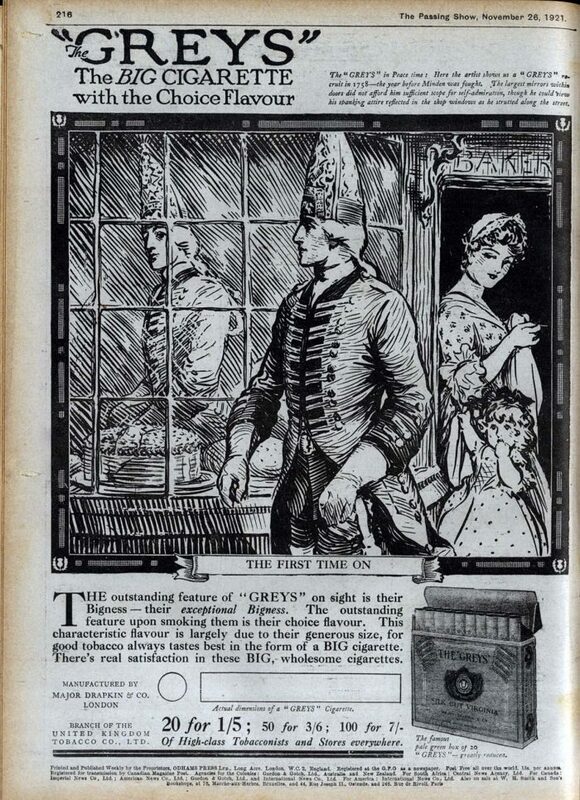 If you were at a loss for words, you might break the ice with the trading cards manufacturers slipped inside cigarette packs, such as these mid-30s beauties that came inside packs of Greys, a now-defunct British cigarette brand, and favorite of WWI vets. Great Scott! Were they psychic!? "Picadilly, London, A.D. 2500: Roofed-in under non-conductive mica glass . . moving pathways . . rubber roadways avenued into 50, 100, 150 and 200 miles per hour . . suspended mono railways . . motors driven by atomic energy . . phonetic spelling . . wireless television . . lighted by captured solar rays . . excursions to Mars." I'm fine with excursions to Mars and monorails but atomic energy is as problematic as the health claims once put forward by cigarette ads. "At the Customs House on the Roof of London, A.D. 2500: The railway train has followed the ichthyosaurus into extinction. Mighty aerial liners transport passengers in their thousands, with great cargoes of merchandise from continent to continent. Mankind, living amidst such tremendous achievements, thinks, plans, and acts with corresponding bigness." 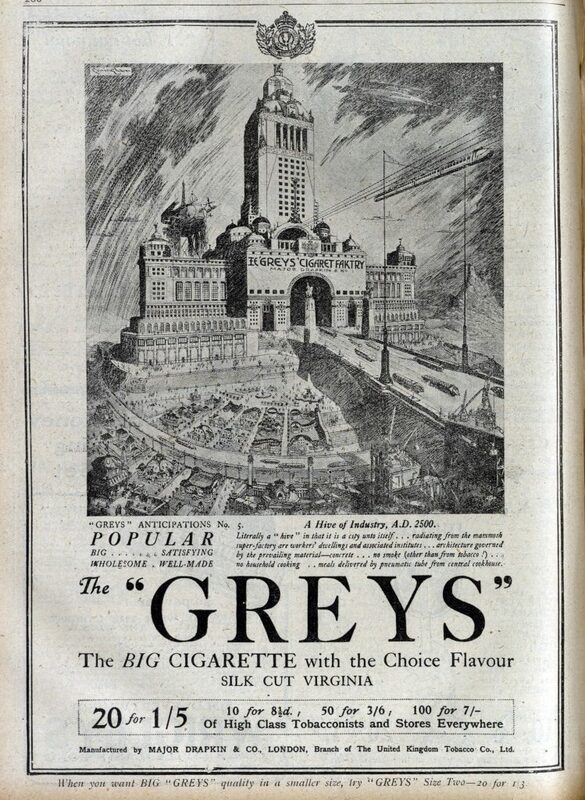 "The Pleasure City, London, A.D. 2500: Pleasure-seeking has been raised to a fine art . 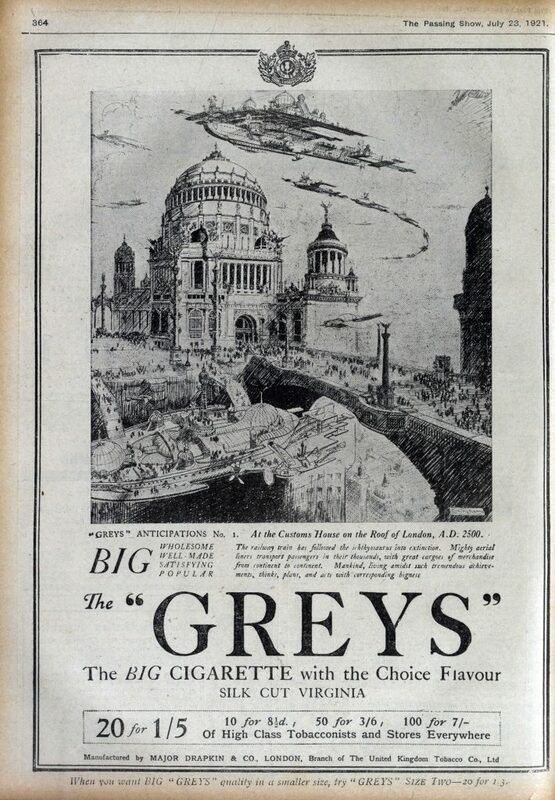 . . mutitudes when the short day's work is done find a satisfying means of relaxation in smoking "GREYS" Cigarettes and listening to the mammoth mechanical orchestra . . . characteristic of the music of the period . . . music so complex that it can be rendered only by wonderous mechanism." This does sound rather fun, depending on who's doing the programming... perhaps we should just stick with headphones and a busker on every corner. A Hive of Industry, A.D. 2500: Literally a "hive" in that it is a city unto itself . . . radiating from the mammoth super-factory are workers' dwellings and associated institutes . . . architecture governed by the prevailing material -- concrete . . . no smoke (other than from tobacco!) . . . no household cooking . . meals delivered by pneumatic tube from central cookhouse. Um...I strongly suggest revisiting Terry Gilliam's 1985 film, Brazil, before signing off on the whole pneumatic tube thing. Darran Anderson, author of Imaginary Cities, took a closer look at one of the cards in the above talk about imaginary London. I share his opinion that “phonetic spelling... is the best thing that they envis­aged of the future." 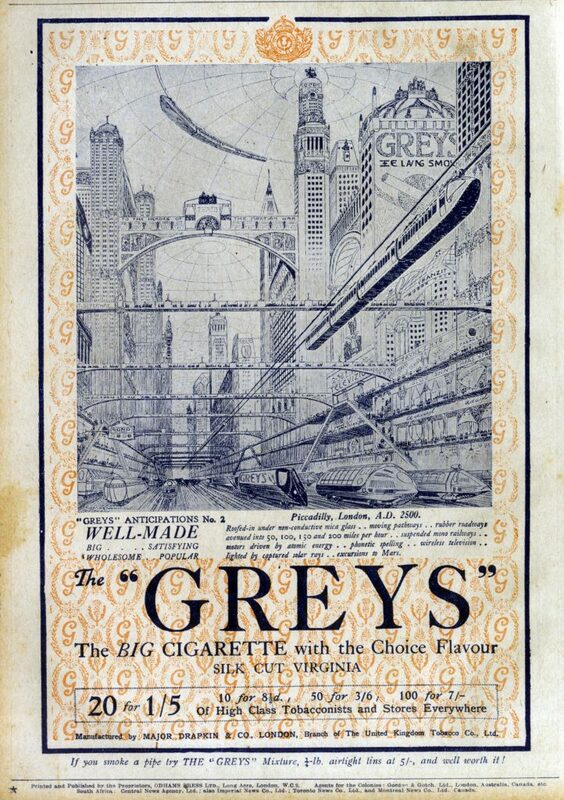 He also notes that the card is about 20 years ahead of its time in promoting a mid-50s-style vision of the future, but that it failed to predict the demise of Greys Cigarettes, by prominently advertising them on the side of a suspended monorail.